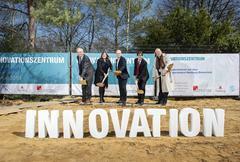 The mayor of Hamburg, Dr. Peter Tschentscher, symbolically broke the ground together with his deputy, the Senator for Science Katharina Fegebank, the Chairman of DESY’s Board of Directors, Dr. Helmut Dosch, the President of the University of Hamburg, Dr. Dieter Lenzen, and DESY’s Chief Technology Officer, Dr. Arik Willner, to mark the commencement of the building work for the Innovation Centre on the DESY Campus. The Innovation Centre in the Hamburg district of Bahrenfeld is a joint project between DESY, the University of Hamburg and the City of Hamburg and will give a face to Science City Bahrenfeld as a high-tech centre in the west of Hamburg. Once completed, in early 2021, it will provide some 2600 square metres of office and laboratory space for entrepreneurs and start-ups in those areas of research being pursued on the campus. 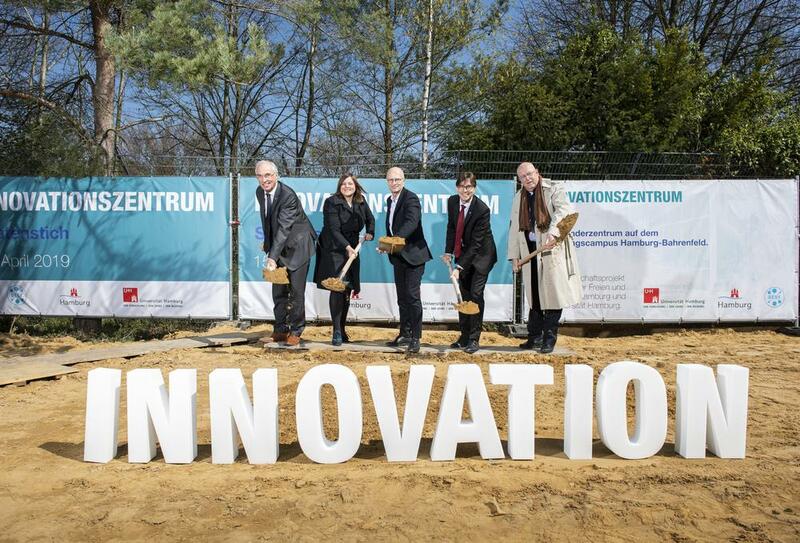 The Innovation Centre will be run by the company ‘Innovationszentrum Forschungscampus Hamburg-Bahrenfeld GmbH’ and its managing partner Arik Willner. “The Hamburg government is paving the way for science and innovating companies to connect in order to establish successful chains of innovation. The Innovation Centre next to DESY is an integral part of the future Science City Bahrenfeld and important for our science and research strategy. Bright minds working for start-ups and innovators can connect with world-class scientists and develop new ideas“, says Mayor Peter Tschentscher. The new Innovation Centre is being built alongside the Centre for Free-Electron Laser Science (CFEL) and access to it will be from Luruper Chaussee, opposite Stadionstraße. Some 2600 square metres of usable floor space will be available in the form of office and conference rooms, co-working areas and a small cafeteria. The construction costs of approximately 17.5 million euros are being financed by the City of Hamburg, which is contributing 14.2 million euros. The remaining 3.3 million euros will be provided by DESY. “The research ecosystem at the Bahrenfeld research campus and the open culture of science that is fostered here provide an extremely fruitful environment for innovation and the transfer of ideas and new developments in science and education to business and commercial applications. 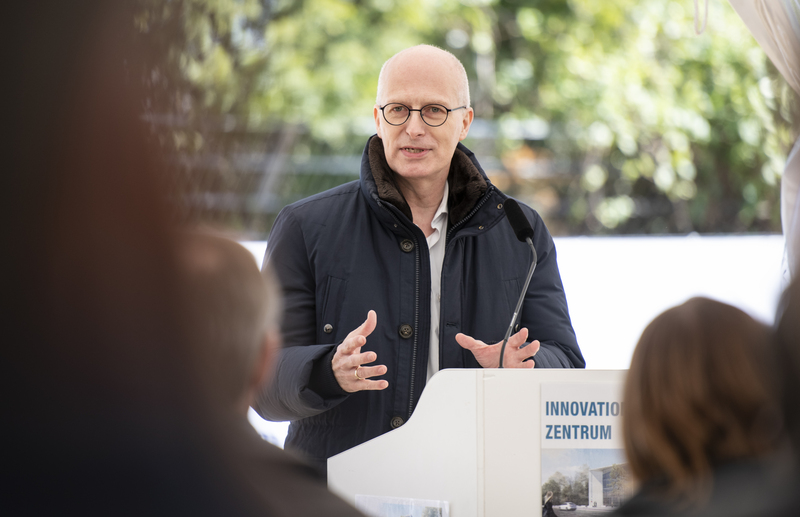 Through the Innovation Centre, we will ensure that these are made available more quickly not only to entrepreneurs but also to the city of Hamburg and to society at large,” says Arik Willner, emphasising the significance of such an incubator. At the moment, the DESY Innovation Village which was opened in February provides office, workshop and laboratory space for young DESY start-ups. In addition to the Innovation Centre and the DESY Innovation Village, DESY is also currently planning an integrated technology and start-up centre on behalf of the national government, with the support of the City of Hamburg. This will focus on start-ups in the fields of life sciences, biotechnology and nanotechnology, as well as new materials, and will provide the complex laboratory infrastructure that is necessary in those sectors, complete with all the requisite safety facilities. The long-term vision is to forge close ties between the science hub and industrial enterprises, which can benefit enormously from the scientific excellence on the campus – including two clusters of excellence at the University of Hamburg. A resilient and well-connected system like this will increase the potential for innovation both in science and in the business sector.